regardless of age, breed or training. 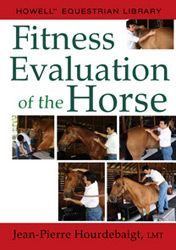 You will be able to give a good report to any of your client on the fitness of their horse. This approach will help you better explain to your client about his horse actual aptitudes which in turn will help better customize the training program, identify signs of strain, and provide better care for that horse. If your client wants to buy a horse, this technique will help you pre-assess prospects before getting the complete veterinary examination. When looking at several horses prospects, it would save your client a fair amount of money. How to perform an assessment of the horse’s musculoskeletal system, with twenty-five points on each side. You will learn to palpate the entire spine. You will learn to palpate the entire thorax. You will learn to palpate the entire forelimb. You will learn to palpate the entire hind limb. This hands-on course will fine tune your palpation skills, your knowledge of conformation, and your overall understanding of the horse kinesiology. This will improve your massage performance, and enhance your relationship with your client and their horse(s).